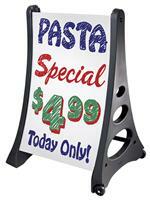 QLA® Write On Wash Off Message Board Sign Face. Replacement face for standard size QLA® message board signs. Price includes 2 sign faces. Markers sold separately. 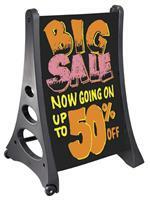 2 - 24'' x 36'' x 10mm corrugated plastic sign face. Choose White or Black. A-Frame message board sign with bright colored marker set. This a frame was wheels making it easy to move from inside your store to the sidewalk. Just Tip and Roll. A-Frame message board sign with bright colored marker set. This a frame was wheels - easy to move. Black sign face with highly visible neon colored markers.